16" Transitional Curved Grab Bar (Brushed Nickel),Transitional Curved Grab Bar of 16" in brushed Nickel. Transitional Curved Grab Bar of 16" in brushed Nickel. This 16” (40 cm) curved bathroom grab bar is part of the bathroom fall prevention system. 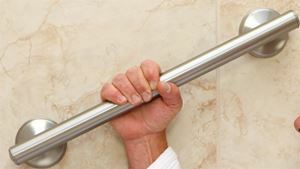 These safety grab bars are stylish bathroom fixtures capable of supporting up to 500 lbs (226 kg).